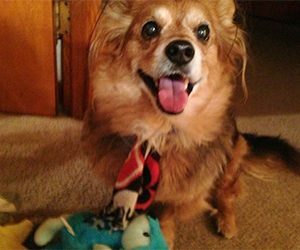 Gizmo Kuhns is a Pomeranian mix that is 12 years young. He is full of energy and loves to play. He’s also Martha Kuhns’ best friend. Martha received Gizmo in 2004 when he was just four months old from a coworker. Gizmo entered Martha’s life at a difficult time. Her mother had passed away a few months earlier and she was lonely. “He came to me when I needed him,” said Martha. The little puppy was supposed to grow up to be no more than 10 pounds and wasn’t supposed to shed. Now, Gizmo is up to 25 pounds and sheds tremendously. The energetic puppy was a handful, and to this day he’s as playful as ever. Understandably, Martha was devastated when she found out Gizmo had cancer. She came back from vacation and picked up Gizmo from a pet motel. She noticed he had a horrible cough. Thinking it was kennel cough, she took him to her primary care veterinarian. During the visit, the veterinarian felt a lump on Gizmo’s throat. After an x-ray, the veterinarian told her it was most likely thyroid carcinoma, or thyroid cancer. Tests also confirmed that Gizmo’s thyroid tumor was cancerous and that the tumor was too firmly embedded to be surgically removed safely. In situations like this, radiation therapy (RT) is typically the treatment of choice when surgery is not an option. Gizmo was referred to PetCure Oncology at Care Center in Cincinnati, Ohio, for stereotactic radiosurgery (SRS). A single plan was created to treat both his thyroid carcinoma and adrenal tumor. Care Center is one of a handful of locations in the United States that offers SRS, a new advanced form of radiation therapy that delivers high doses of radiation with sub-millimeter precision. Because it is so precise, it can target a tumor with minimal damage to the healthy tissue around it. This therapy requires fewer sessions and has little-to-no side effects. 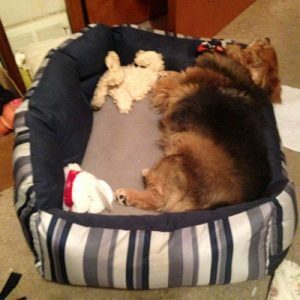 Martha recollects the time after Gizmo’s diagnosis as one of the hardest moments for her. 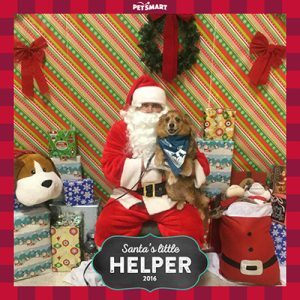 Gizmo received three sessions of SRS from December 7 to December 9, 2016, for his adrenal and thyroid tumors. 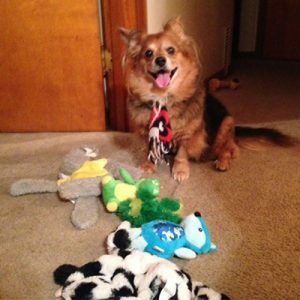 Martha explained that she was happy to find that during and after his SRS treatment, Gizmo remained his playful self. He experienced no side effects. A two-week checkup with their primary care veterinarian showed that Gizmo’s tumor was smaller than before. According to Martha, as of December 22, Gizmo was still doing great. We are so happy Gizmo and Martha were able to spend another Christmas together. Gizmo loves to play with his toys. Look at that pile! Time for a nap after all that playtime. If your pet has been diagnosed with cancer, contact a PetCure Oncology location near you. Our team is ready to answer your questions and find the best treatment option for your pet.